You're familiar with the term "land yacht" to describe huge, old, floaty American cars. The world's super-wealthy have a new class of vehicle. 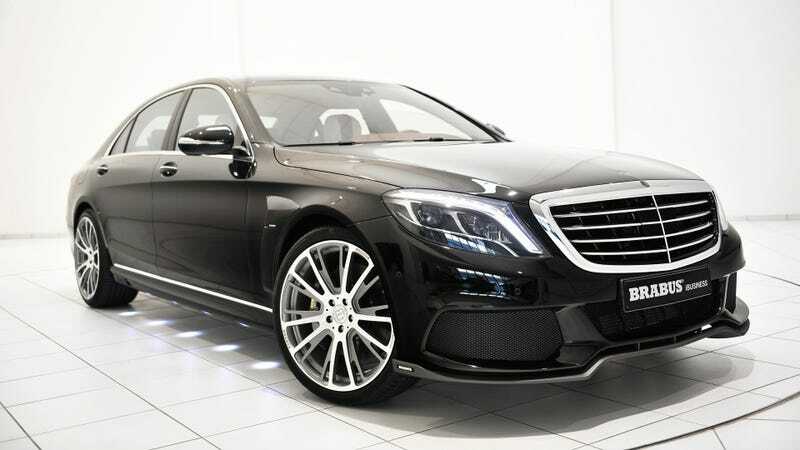 I'm calling it the Land Jet, and it's typified by the new 850 horsepower BRABUS S Class. Basically, the Brabus 850 Biturbo is what happens when some nouveau riche billionaire decides that the Mercedes S65 AMG is neither powerful or ostentatious enough. I mean, that car only has 621 horsepower. Pitiful. German über tuner Brabus took a smaller S63 AMG, bored its 5.5 liter engine to 5.9 liters, gave it beefier internals, upped the boost with two new turbos, sheathed the intake and charge-air tubes with real gold, and ended up with an extra 265 horsepower over stock. Now with 850 horses and 1,069 lb-ft of torque, I can only imagine full bore acceleration feels like takeoff. The estimated 0-60 mph time is 3.5 seconds and the weight is surely over 5,000 lbs. Matching the aircraft-grade acceleration is the aircraft-grade interior. There's a star night headliner, integrated iPad mini, a custom rear center console, an integrated Mac mini computer, a 15.2-inch TFT display, and a number of outlets and plugs. The rest of the interior is available in any shade of leather, any quantity of wood, and any garish amount of carbon fiber. The Brabus 850 iBusiness will debut at the Frankfurt Motor Show next week. Your new Land Jet awaits.